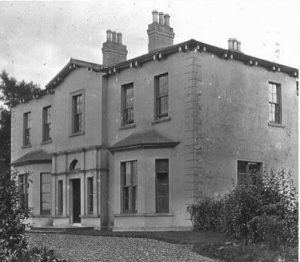 1) (exemplified to John Williamson Fulton, of Braidujle House, Lisburn, co. Antrim, J.P., son of John Williamson Fulton, Esq., by Anne, his wife, dau. and co-heiress of Robert Robertson, Esq.). Quarterly, 1st and 4th, ar. a lion ramp. az. a bend gobony erm. and gu. in the sinister chief point a mullet sa., for Fulton; 2nd and 3rd, gu. three wolves’ heads erased ar. in the centre chief point a crescent or, a bordure engr. of the second, for Robertson. Crest—A cubit arm erect grasping a broken javelin all ppr. the arm charged with a mullet sa. Motto—Vi et virtute. 2) (Inchinnan, co. Renfrew). Az. diapre or, semee of fleurs-de-lis of the second, on a fesse ar. a boar’s head erased of the first. Crest—On a mount vert a stag lodged reguard. ppr. Motto—Quae fecimus ipsi. 3) Or, a lion ramp. az. 4) Ar. (another, or) a lion ramp. az. a bend gobonated ar. and gu. 5) (Wimple Street, London, 1841). Ar. a lion ramp. az. a bend gobony erm. and gu. This is a local name meaning “of Fulton”, which historian Mark Antony Lower believes is an extinct border village in county Roxburghshire in England. According to the Dictionary of Family Names, it is likely a reduced form of the surname Fullerton, and it comes from the Old English word fugol (bird) and tun (settlement). Common spelling variations of this last name include: Ffulton and Fullton. The earliest recorded person bearing this surname was Thomas de Fulton in 1260 AD, who witnesses a donation during the reign of King Alexander III of Scotland. In 1272 AD, a one Thomas de Fulton witnessed a quitclaim of the land of Fulton and the next a year, a one Alan de Foulton witnessed a grant by Malcom, Earl of Lenevax, to one Paisley. In 1296 AD, Henry de Foultone (of Lankashire) and Thomas de Fougheltone rendered homage to King Edward I of England. The Hundred Rolls of 1273 AD, a census of Wales and England, known in Latin as Rotuli Hundredorum, documents two people bearing this last name: John de Fultone in county Cambridgeshire and Robert de Fulton. Bernard Burke’s book “The Landed Gentry” discusses one branch of this family: Fulton of Braidjule. The family was originally settled in Ayrshire and held lands in Muiton, in Beith parish. On September 8th, 1614, the Privy Council directed Revered Dr. Fulton to visit Lady Arabella Stuart, then a prisoner in the Tower, for having married Mr. Seymour, afterwards 1st Marquess of Hertford. From this Dr. Fulton is stated to have descended, the Reverend Robert Fulton, of Guanabo, Island of Jamaica. He married and with his wife had two sons. The elder son was Richard Fulton, Esq, a Captain in the army of King William III, who settled at Bellasize near Lisburn, on the estates of the Seymour family. He married Margaret Camac and had two sons with her. The second son, John, was appointed Registrar of the Supreme Court of Calcutta in 1787. He died at sea on his voyage home after being a merchant in India, in 1800. He married Anne Wade of Castletown Delvin and had three daughter with her as well as three sons: Joseph (born 1750, who married Ann Graham and had numerous issue with her), James, and John Williamson. The third son, John Williamson, was born in 1769 who went to India with his father and became a prominent merchant and was High Sheriff in 1817. He married Anne, the widow of Captain John Hunt, and the daughter and co-heiress of Robert Roberson, Esq. and left issue with her: John Williamson, Joseph Hennessy, Eleanor Sophia, Anne, Mary Charron, and Charlotte Hayes. The eldest son, John Williamson was born in 1814 and was Barrister-at-Law, M.A., J.P. in counties Antrim and Down. He married Matilda in 1840, who was the daughter of John Montgomery Casement and left the following issue: John Williamson Casement (1841), Edmond Casement Pollard (1843), Edmons McGildowney Hope, Esq. now of Braidjule, George Wade Robertson (1853, a Lieutenant in the Royal Army), and Josephine Mary McGildowney (who married Theodore Cracoft Hope in 1866). This line bore the following coat of arms: Quarterly: 1st and 4th, arg., a lion rampant az. A bend gobony ermine and gules in the sinister chief point a mullet sable, for Fulton; 2nd and 3rd, gules, three wolves’ heads erased argent. in the centre chief point a crescent or, a bordure engrailed of the 2nd, for Robertson. Crest—A cubit arm erect grasping a broken javelin all proper, the arm charged with a mullet sable. Frances Fulton was born in 1770 AD in Cecil County, Marlland. In 1790, he married Mary Word in North Carolina and together they had two issue: Samuel and Elisha. Samuel was born in 1792 in Stokes County, North Carolina. He married Nancy Redman in 1816 and had numerous issue with her: Bethenia, Wilson, Winston, Nancy, Samuel W., Mary, Francis, Abrham, Saunders, and Margaret. His son Wilson was born was born in 1819. He married Mary Ann Davis and together they had the following children prior to him dying in 1875 in Lampasas, TX: Nancy Elizabeth, James Samuel, Charles Edwin, Mary, and Louretta. James Samuel Fulton was born in 1844. Early settlers to America include Gowen Fulton (New England 1730), Philip Fulton (New York 1760), Andrew Fulton (Kentucky 1797), and Alexander Fulton (Maryland 1803). One of the earliest settlers in Canada bearing this surname was Ann Fulton, who arrived aboard the Salus in 1833 in New Brunswick. The family mottoes include 1) quae fecimus ipsi, which means “things which we ourselves have done” and 2) parta labore quies, meaning “rest attained by labour”. 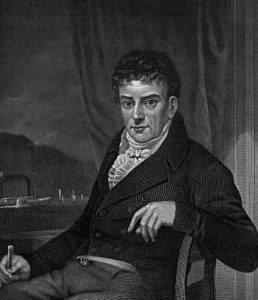 Famous people with this last name include: 1) Andrew Fulton (1850-1925) was who Mayor of Pittsburgh, 2) Robert Fulton (1765-1815) who was an American engineer and inventor most known for developing the steamboat, 3) General Walter Scott Fulton (1879-1959) who was an American General that commanded Fort Benning.